The Letter. Skip to the bottom to see it in context. The other day, we received a large delivery. We were trying to figure out what to do with it as the delivery man wheeled the shrink-wrapped block of boxes into the office. We decided to use the shared storeroom for the time being, and I went to open the door to it. The delivery-man looked at the doorway, looked at us and looked at the block of boxes. He looked at the doorway again. “If we tip it on it’s side…” we began, but he was already detaching the hand-truck from the boxes, and before we could finish, he’d walked out the door and left us to it. You can’t blame people for not wanting to do more than the requirements of the job. If you aren’t being paid to go beyond the call of duty, it is of course totally reasonable not to. His job was done. That said, when people do go the extra mile to help you out, isn’t it awesome? There’s something genuinely gratifying about it. Shortly after the delivery incident, we realised the delivery man had left us with the wooden pallet he’d wheeled the boxes in on. We couldn’t leave it in the office, so we dragged it down the road. There was a building site nearby. A foreman saw us approaching, splintery wooden pallet in tow. “Sorry, do you have a skip we can dump this in?” we asked. “Don’t think so fellas,” he began, but then he paused. He looked at the building site and then back at us. “OK, you know what, don’t worry about it. Leave it with me,” he said. He was under no obligation to help us out at all, and he wasn’t being paid, but he did it anyway. We deal with customers multiple times a day and one of the things we’ve tried to do, from the outset, is go the extra mile to show people we can offer them a helpful service. As a startup, we aren’t tied down by bureaucracy and procedures. So when people need us, we do our best to accommodate, even if it means going out of the way to do so. In fact, many of our most pleased customers have been those with whom there was initially a mistake, or a miscommunication. Speedy efforts to rectify a problem can not only appease unhappy customers, but actually convert them into happy ones. I’m sure we aren’t always perfect in this regard, and I’m sure we’ve let people down accidentally, but I think the principle is an important one. Going beyond the call of duty to offer good customer service might cost you time and money in the short run, but it can only pay off in the long run, and can win you your most loyal customers. And helping people when they need it is a naturally rewarding feeling. What are examples of going the extra mile? Here are a few of my favourites (building up to the best one). Back when we first launched in April 2016, a customer asked us if we could help with a plan she had for her boyfriend’s birthday. She was organising a Treasure hunt, and she wanted to know if she could use one of our StashPoints as a location to store a clue. We were pretty happy that anyone wanted to use our service at all at this point, because we were still trying to prove the concept. So we called her up to chat about the plan — and in the end we got even more involved. Matt went down to Waterloo station and hovered under the clock, one of London’s most famous meeting points. Her boyfriend was told to look for a ginger man with a parcel. Initially, we weren’t sure — this was obviously not something we had ever catered to before, and we weren’t sure how well it could work. But we didn’t say no. We thought about it, asked her where in London her brother would need the fridge stored, and I made a few calls. Get ready to melt. This story is the best so far. Last week, we received a call from an old man in Leeds. He was calling about baggage left in lost property at the station. We frequently get calls from people mixing us up with station luggage services, and so at first we assumed it was just another one of these. Of course, we obliged, and we thought that would be the end of the matter. Our office is in King’s Cross, so that afternoon, Anthony went to the station to pick up the bag for him. After finding the bag, it turned out that shipping it back required payment online (which the old man wouldn’t be able to do). Anthony completed the forms on his behalf and paid £30 for the shipping. A few days letter, we got this letter. The case & perfume have arrived. 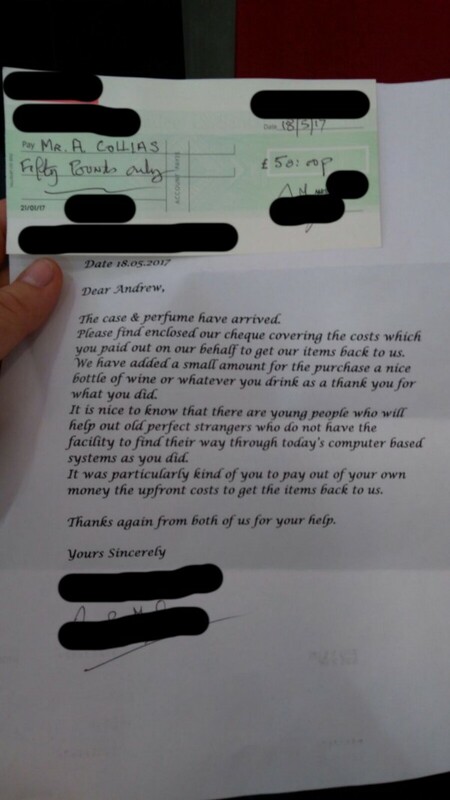 Please find enclosed our cheque covering the costs which you paid out on our behalf to get our items back to us. We have added a small amount for the purchase of a nice bottle of wine or whatever you drink as a thank you for what you did. 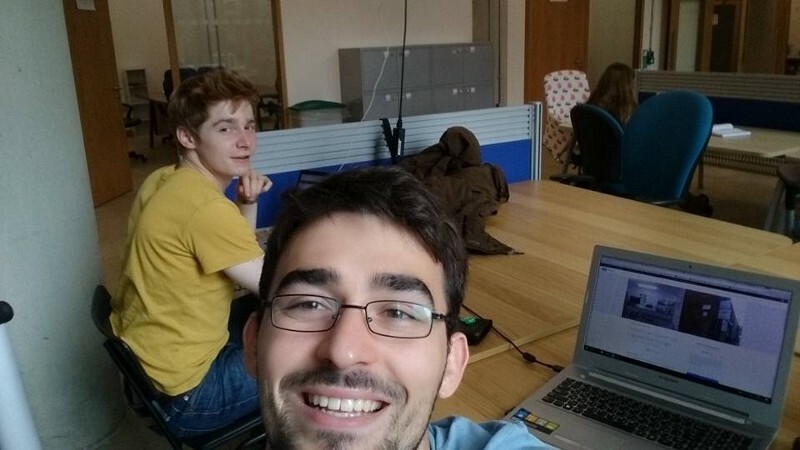 It is nice to know that there are young people who will help out old perfect strangers who do not have the facility to find their way through today’s computer based systems as you did. It was particularly kind of you to pay out of your own money the upfront costs to get the items back to us. Thanks again from both of us for your help. In a world of automated chatbots and outsourced call centres, it’s nice to be able to offer personalised customer support. That’s one of the perks of using startups — you know the people who run it care about offering the best service they can, and they will go the extra mile. There is an underlying tension here though. We as co-founders won’t be able to handle all our customer enquiries forever. When that day comes, we need to make sure that the standard doesn’t drop. All big corporates were startups once, and the scaleable trajectory of any successful startup inevitably drives it in the direction of corpocracy. This is why businesses should invest in quality in-house customer support. The cases above are a testament to offering customer support in-house, with people that care, rather than outsourcing it. We have seen first-hand how responding quickly to a troubled customer can not only win back their trust but even convert them into loyal advocates of your business! It’s worth having a customer support team that are prepared to go beyond the call of duty.